A Bahamas team comprising representatives from the Bahamas Financial Services Board (BFSB) and the Insurance Commission of The Bahamas (ICB) were in Los Angeles, California, last month to participate in the four-day Risk and Insurance Management Society Inc (RIMS) conference. The event has become renowned for the widespread insurance domicile presence, complete with exhibits and special events. 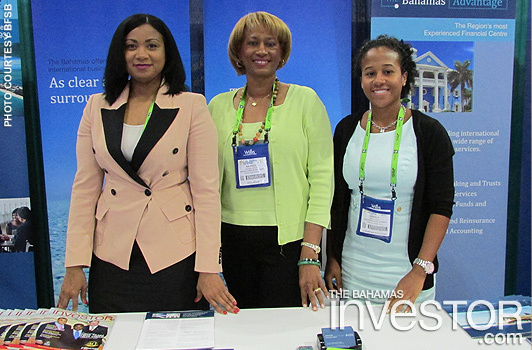 BFSB and the ICB manned a Bahamas booth in the Exhibit Hall of RIMS, providing an ideal mechanism to meet one-on-one with RIMS visitors wanting to learn more about The Bahamas Advantage, the theme prevalent in booth design and materials. BFSB chief executive officer Aliya Allen noted that well over 200 persons took advantage of this opportunity. “There was specific interest in The Bahamas’ risk-based regulatory approach, with booth visitors also seeking general information on corporate and other services offered in our jurisdiction,” she said. This year’s conference ran April 21-24 at the Los Angeles Convention Center and included more than 100 educational sessions spanning 11 categories and offered a variety of networking opportunities, including the hundreds of providers of risk management products and services in the conference’s exhibit hall. Session categories included claims management, employment risks, enterprise risk management, finance, industry, insurance, international, legal legislation, loss control, risk management and strategic risk management. In opening the conference and exhibition, RIMS representatives said risk management continues to evolve as a discipline, bringing added value to organizations and new opportunities to its practitioners. More than 10,000 delegates participated in RIMS 2013. The Bahamas delegation consisted of Aliya Allen and Janelle Sands from BFSB and superintendent Michele Fields of the ICB, accompanied by Patrice McDonald and Kimberly Kemp-Rolle, also of the ICB.